This article is about the Nobel laureate chemist. For Nobel laureate in physics, see Robert Andrews Millikan. Robert Sanderson Mulliken ForMemRS (June 7, 1896 – October 31, 1986) was an American physicist and chemist, primarily responsible for the early development of molecular orbital theory, i.e. the elaboration of the molecular orbital method of computing the structure of molecules. Dr. Mulliken received the Nobel Prize for chemistry in 1966. He received the Priestley Medal in 1983. Mulliken was born in Newburyport, Massachusetts. His father, Samuel Parsons Mulliken, was a professor of organic chemistry at the Massachusetts Institute of Technology. As a child, Robert Mulliken learned the name and botanical classification of plants and, in general, had an excellent, but selective, memory. For example, he learned German well enough to skip the course in scientific German in college, but could not remember the name of his high school German teacher. 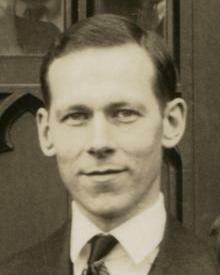 He also made the acquaintance, while still a child, of the physical chemist Arthur Amos Noyes. Mulliken helped with some of the editorial work when his father wrote his four-volume text on organic compound identification, and thus became an expert on organic chemical nomenclature. At this time, the United States had just entered World War I, and Mulliken took a position at American University in Washington, D.C., making poison gas under James B. Conant. After nine months, he was drafted into the Army's Chemical Warfare Service, but continued on the same task. His laboratory techniques left much to be desired, and he was out of service for months with burns. Later he got a bad case of influenza, and was still in the hospital at war's end. At Chicago, he had received a grant from the National Research Council (NRC) which had paid for much of his work on isotope separation. The NRC grant was extended in 1923 for two years so he could study isotope effects on band spectra of such diatomic molecules as boron nitride (BN) (comparing molecules with B10 and B11). He went to Harvard University to learn spectrographic technique from Frederick A. Saunders and quantum theory from E. C. Kemble. At the time, he was able to associate with many future luminaries, including J. Robert Oppenheimer, John H. Van Vleck, and Harold C. Urey. He also met John C. Slater, who had worked with Niels Bohr. In 1925 and 1927, Mulliken traveled to Europe, working with outstanding spectroscopists and quantum theorists such as Erwin Schrödinger, Paul A. M. Dirac, Werner Heisenberg, Louis de Broglie, Max Born, and Walther Bothe (all of whom eventually received Nobel Prizes) and Friedrich Hund, who was at the time Born's assistant. They all, as well as Wolfgang Pauli, were developing the new quantum mechanics that would eventually supersede the old quantum theory. Mulliken was particularly influenced by Hund, who had been working on quantum interpretation of band spectra of diatomic molecules, the same spectra which Mulliken had investigated at Harvard. In 1927 Mulliken worked with Hund and as a result developed his molecular orbital theory, in which electrons are assigned to states that extend over an entire molecule. In consequence, molecular orbital theory was also referred to as the Hund-Mulliken theory. Up to this point, the primary way to calculate the electronic structure of molecules was based on a calculation by Walter Heitler and Fritz London on the hydrogen molecule (H2) in 1927. With the conception of hybridized atomic orbitals by John C. Slater and Linus Pauling, which rationalized observed molecular geometries, the method was based on the premise that the bonds in any molecule could be described in a manner similar to the bond in H2, namely, as overlapping atomic orbitals centered on the atoms involved. Since it corresponded to chemists' ideas of localized bonds between pairs of atoms, this method (called the Valence-Bond (VB) or Heitler-London-Slater-Pauling (HLSP) method), was very popular. However, particularly in attempting to calculate the properties of excited states (molecules that have been excited by some source of energy), the VB method does not always work well. With its description of the electron wave functions in molecules as delocalized molecular orbitals that possess the same symmetry as the molecule, Hund and Mulliken's molecular-orbital method, including contributions by John Lennard-Jones, proved to be more flexible and applicable to a vast variety of types of molecules and molecular fragments, and has eclipsed the valence-bond method. As a result of this development, he received the Nobel Prize in Chemistry in 1966. Mulliken became a member of the National Academy of Sciences in 1936, the youngest member in the organization's history, at that time. He was elected a Foreign Member of the Royal Society (ForMemRs) in 1967. Mulliken population analysis is named after him, a method of assigning charges to atoms in a molecule. In World War II, from 1942 to 1945, Mulliken directed the Information Office for the University of Chicago's Plutonium project. Afterward, he developed mathematical formulas to enable the progress of the molecular-orbital theory. In 1952 he began to apply quantum mechanics to the analysis of the reaction between Lewis acid and base molecules. (See Acid-base reaction theories.) He became Distinguished Professor of Physics and Chemistry in 1961 and continued in his studies of molecular structure and spectra, ranging from diatomic molecules to large complex aggregates. In 1981, Mulliken became a founding member of the World Cultural Council. [not in citation given] He retired in 1985. His wife died in 1975. At the age of 90, Mulliken died of congestive heart failure at his daughter's home in Arlington, Virginia on October 31, 1986. His body was returned to Chicago for burial. ^ a b c Longuet-Higgins, H. C. (1990). "Robert Sanderson Mulliken. 7 June 1896-31 October 1986". Biographical Memoirs of Fellows of the Royal Society. 35: 328. doi:10.1098/rsbm.1990.0015. ^ Darrah, William Culp; Lyons, Paul C. (1995). Historical Perspective of Early Twentieth Century Carboniferous Paleobotany in North America. United States of America: Geological Society of America. p. 175. ISBN 0-8137-1185-1.